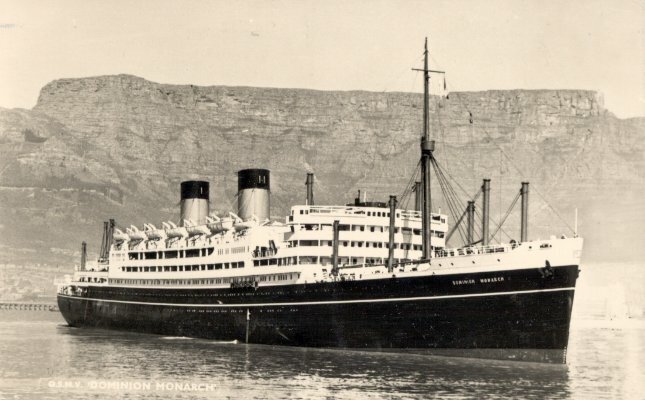 He was sent to Royal Air Force Hook in Surrey and in March 1942 embarked in March 1942 aboard the QMVS Dominion Monarch. Originally they were destined for the Far East but Rangoon had fallen and their final destination was uncertain. They were entrained for Liverpool and embarked on Dominion Monarch as soon as they had left the railway station. They sailed in a convoy that included the carrier Indomitable. They sailed to Freetown, Capetown and then on to Bombay. They were disembarked and went by rail to Deolali and after some time were sent back to Colaba Camp and then embarked on HMT Dilwara for Abadan, Iran. HMT Dilwara sailed alone and relied on her fast speed to outrun any U boats. They were given the task of defending the enormous oil refinery there. This refinery supplied one fifth of the allied oil supplies and as such was a potential target for enemy action. This was one of the most luxurious liners ever made. She was converted to a troopship for war service. She travelled the route to Australia / New Zealand and the UK. There were special deep freeze holds that were used to bring meat back to the Uk in peacetime. The holds were converted to accommodate troops using hammocks and scrambling nets to get up and down the hold. He is second on the left and note the solar topee and the life jacket! This must have been very usefull to help keep the troops cool in the hot sun. It was used in a strict rota and was also used for the "crossing the line ceremony". This was a transit camp in India and had served as a rest station for many troops. He was taken by rail and stationed here for a few days. This was a very old camp near Bombay that was used to hold troops prior to a further posting and awaiting transportation by sea. This was an enormous place. It was staffed by civilians and protected by UK and American troops. These were used by the refinery and the locals to build houses they were made from local clay. They were used to make beds for the barrage balloons. Note the miles and miles of pipes. The refinery was built with no thought of a possible war and was very vulnerable to attack. Many anti-blast defences had to be added to the pipelines as well as extra fire defences. This was a standard drill practiced by the troops. My father is second from the left. Note the sand and the fact that they are still wearing RAF blues! The food was cooked using basic field cooking techniques. The food was poor as local vegetables were in short supply. Every mouthful had some sand in it!